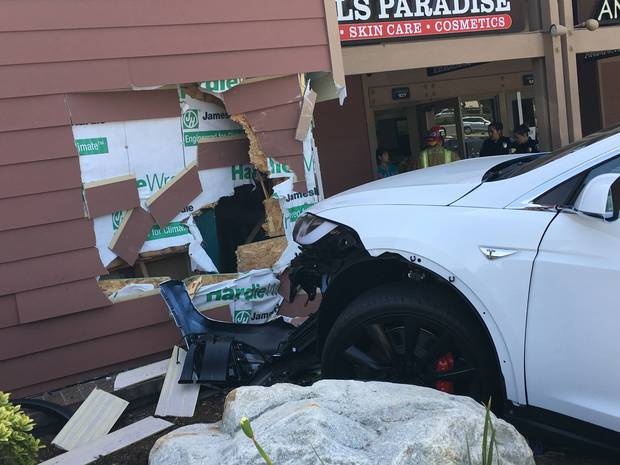 The owner of a brand-new Tesla Model X SUV said the car suddenly accelerated at "maximum speed" by itself, jumped a curb and slammed into the side of a shopping mall while his wife was behind the wheel. 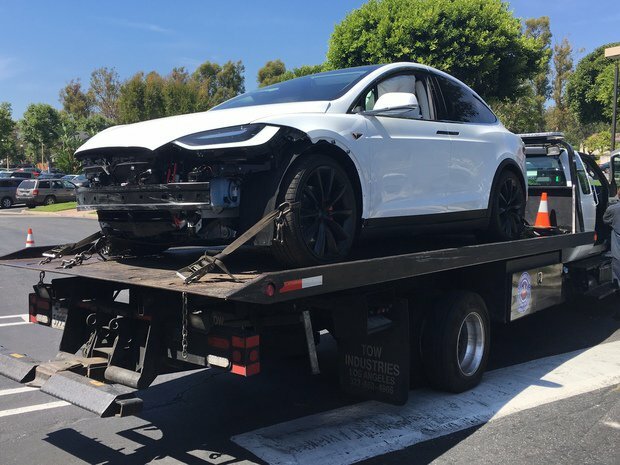 The owner of the Model X, Puzant Ozbag, said the vehicle had been delivered only five days earlier to his home in Irvine, Calif., where the accident also took place. He said his wife had not activated any self-driving features at the time of the crash. The damage to the front end of the Model X and the shopping mall building in Irvine, Calif.
"My wife is 45 years old and has had a driver's license almost 30 years and has a clean record. It's not like she's a 90-year-old person who's going to press the gas pedal instead of the brake," Ozbag said in an interview with Computerworld. "She's been to that shopping center a millions times. It's a mile and half away from our house," he added. 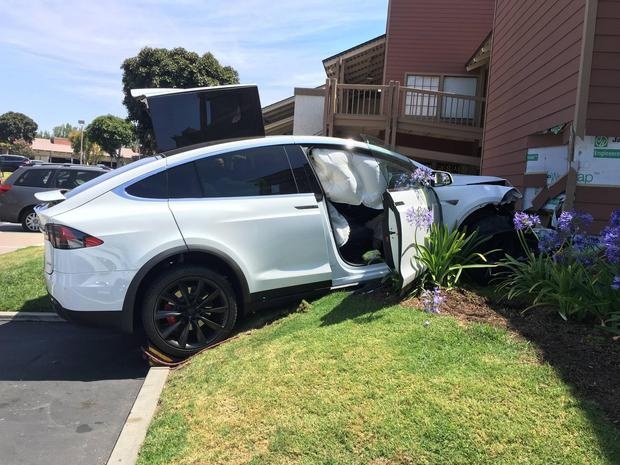 Puzant, who wasn't in the SUV at the time of the crash, said it was fortunate that the vehicle's front wheels were turned slightly left as his wife was pulling into the parking space because if they'd been straight, the Model X would have plowed into a nail salon and could have killed someone. The accident, which occurred at about 2:30 p.m., injured his wife's arm and caused major damage to the SUV's front end. His wife's arm was burned during the crash, likely from the airbags being deployed, and remains swollen today, Puzant said. Puzant said he contacted Tesla directly after the accident and was told to have the vehicle towed to a storage area until a repair facility was open today to receive the SUV. Today, Tesla's roadside assistance contacted Puzant and said they were "downloading" data from the vehicle to discover what may have happened. 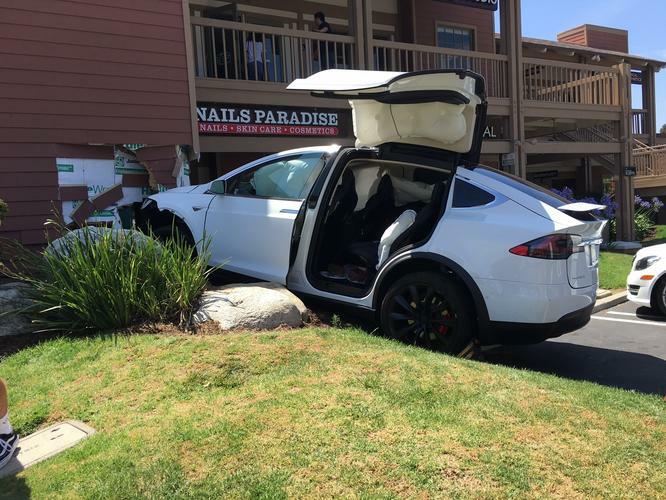 Another angle of the Model X after it jumped a curb and crashed into the side of a shopping mall. "I don't' know if they're going to acknowledge if it was their fault," Puzant said. Tesla did not immediately return a request for comment from Computerworld. Released by Tesla last September after several delays, the Model X is a full-size, all-electric SUV with rear gull-wing doors. Since its release, Tesla has admitted to problems with the gull-wing doors opening properly and even filed a lawsuit against car parts manufacturer Hoerbiger Automotive Comfort Systems for not producing satisfactory parts. Hoerbiger has denied any responsibility for the problems. Like the Model S sedan, the Model X has Tesla’s "Autopilot" feature that allows it to perform some advanced driver assistance systems (ADAS) functions, such as automatic lane-keeping, adaptive cruise control and automatic braking. The vehicle can also change lanes automatically once the turn signal is turned on. If the Model X accident turns out to have been caused by a faulty autonomous vehicle system, it would not be the first reported by a Tesla owner. Last month, a Model S owner from Utah reported that his sedan started itself and rammed into the back of a trailer bed after he'd placed the vehicle in park and gone into a store to run an errand. The Model S's owner, Jared Overton, said he'd even stopped outside the vehicle to talk to someone for a few moments before going into the store. Five minutes later, Overton said he emerged from the store to find his Model S's front end under the rear of the trailer. The windshield was smashed during the crash, Overton told KSL News. Puzant said he's still waiting on Tesla to get back to him about how they'll be handling the repairs to the vehicle, but he wants a new car considering that his was only five days old. He called on the company to investigate whether it's a systemic problem. "This is a major problem and Tesla should stop deliveries and investigate the cause of this serious accident," Puzant said.